In the late ‘80s and early ‘90s, a sneaker commercial famously asked the question, “Is it the shoes?” If you’re looking for the cause of back pain, the answer could very well be, “Yes.” Athletic shoes are meant to be used to protect your body from the rigors of exercise, but if you choose the wrong shoe or if you use them improperly, they can harm your back. At Total Chiropractic Care and Wellness, we’re committed to helping our patients live healthy lifestyles with as little pain as possible. We want to tell you what you need to know about the relationship between athletic shoes and back pain so you can make the right decisions when you choose your footwear. Making the wrong choice when you buy athletic shoes can lead to several problems. Footwear can affect your bones, hips, and joints. Making sure you have the right shoes can often save you from pain. Athletic shoes are probably the best choice for support, but it’s important that you don’t let being fashionable win out over being healthy. Choose sensible athletic shoes. And make sure you don’t overuse them. Dr. Lewis C. Maharam, a sports medicine practitioner wrote in the New York Daily News that you should put a maximum 500 mile limit on your running shoes and then replace them. Unfortunately, there isn’t a single type of shoe that’s perfect for everyone. That’s because everyone has different features and different comfort levels. But there are different types of feet and you should match your foot type to the type of shoe you wear. However, organizations like the Australian Podiatry Association and Harvard Medical School have put together lists that can help you find the right shoe for the shape and needs of your feet. If you have normal feet with a normal-sized arch, your feet will land on the outside of the heel and roll slightly inward, according to the experts. The best type of athletic shoe for this type of foot would be stability shoes with a slightly curved shape. If you have flat feet, you’ll have low arches and your feet will land on the outside of the heel and roll excessively inward. 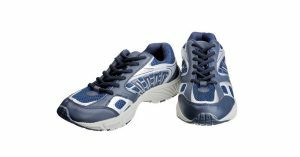 Motion-control shoes or high-stability shoes with firm midsoles work best. The shoes should be resistant to twisting or bending. You should also stay away from highly cushioned or highly curved shoes. But if you have high-arched feet you will want cushioned shoes with plenty of flexibility to encourage motion. People with high arches tend to have feet that don’t absorb shock enough. Whatever shoes you choose, you should always want to make sure you monitor any pain you might be feeling. If you feel that you need relief from persistent back pain, Total Chiropractic Care can help. Dr. Todd Goldman has been practicing for more than 20 years and he’s certified in many types of chiropractic treatment. To get started contact us today.